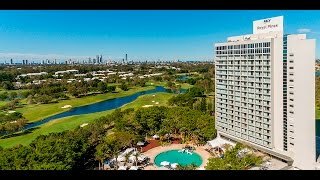 RACV Royal Pines Resort Gold Coast is the perfect destination for experiencing the best of the Gold Coast. Surrounded by manicured gardens and a championship golf course, this 100-hectare resort is perfectly positioned just a short distance from the white sandy beaches of Surfers Paradise and the lush beauty of the Gold Coast Hinterland. Whether for business or pleasure, the resort features something for everyone. Award-winning restaurants and bars, day spa, gymnasium, brand new children’s water park, impressive children’s playground, pools and award-winning conference and event spaces. Shuttle busses are available for guests five times daily to both Broadbeach and Surfers Paradise. The Executive Lounge is located on level 21, adjacent to the new Videre Restaurant. This area is exclusively for Executive room guests and RACV Club Members. It features a private meeting area, modern and comfortable James Moran furniture and spectacular views of the Gold Coast. Executive room guests not only have access to the Executive Lounge but the rate also includes valet parking, full buffet breakfast daily, light refreshments during the day, nightly canapés and drinks, plus, complimentary internet access in the lounge and in any of the Executive Suites. Offering great views of the resort's chic pool area or Gold Coast skyline, Superior Rooms offer a modern and contemporary style with balconies to take in the view and soak up the balmy air. Spacious, with either a king size bed or two double beds, these rooms feature calm, neutral tones, modern artwork, smart cane daybed and mood lighting. Very popular among regular Resort guests, the Spa Suites feature a split level lounge / bedroom area and luxurious marble bathrooms with Jacuzzi spa and expansive views of either the mountains, pool, lake or coast. These suites have one king bed and are available with or without a balcony. Located on floors four to 20. Spaciously appointed, the Mountain View Rooms have been refurbished to reflect a modern and comtemporary style which enhances the beautiful views of the Gold Coast Hinterland and mountains. Features include two double beds, minibar, ensuite bathroom and tea and coffee making facilities. Located on floors four to 20. Great for family or friends travelling together. A rollaway bed, if required, is AUD50 per night.